I have to confess that I feel increasingly baffled when I see people carrying plastic water bottles around now. Save cutting down on recycling massively, the aesthetic and practical benefits of an insulated water bottle are heard to beat. As a convert myself I carry a bottle daily; in my bag mid meetings, to and from yoga and (increasingly less) the gym, and they were invaluable on a recent family holiday in Italy. Put simply, an insulated bottle keeps your drink as hot or cold as when you made it; that for me is the latter, and it stays joyously icy as when I first made it, even in a 31 degree class. 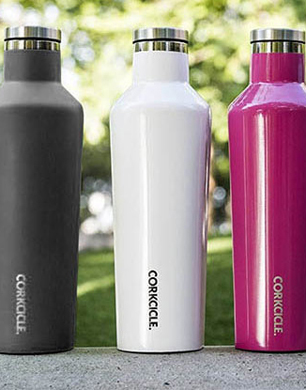 I’ve recently converted to the fabulous Corkcicle Canteen featured here, as it’s understated good looks conceal amazing function and practicality. Sturdy, well-built style and function- that’ll be your Covetable right there.